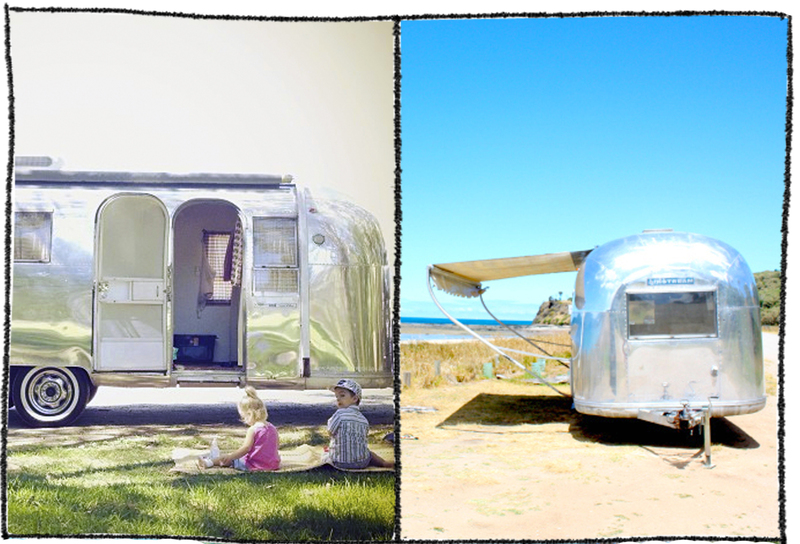 Wallabee has made her first Aussie Airstream friend – a gorgeous 1966 Trade Wind called Peggy Sue. 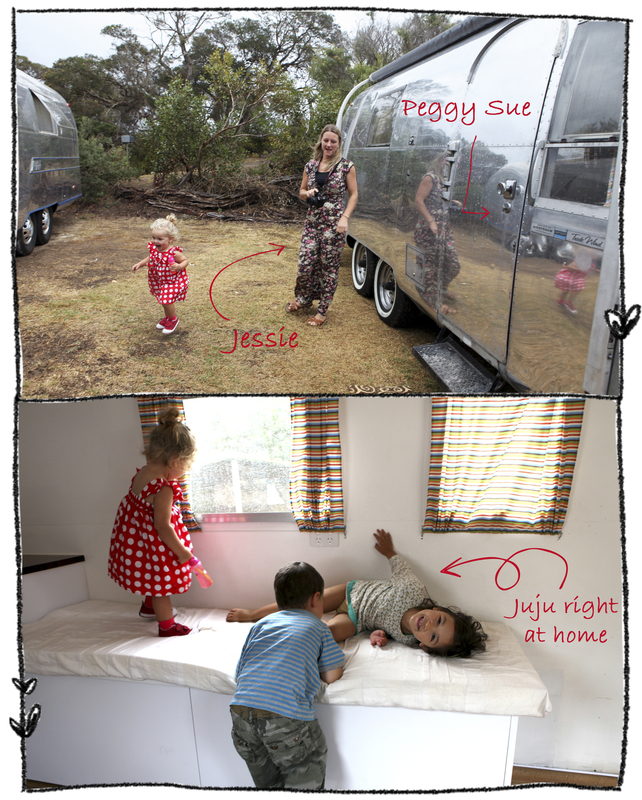 Jess and Scott imported and renovated her last year for their business Airstream Dreams. Since October, they’ve been hiring out Peggy Sue as a bespoke exhibition/marketing/wedding space. Jess and I had been itching to check out each other’s trailers since we met online last year. Our kids are similar ages and coincidentally she lives ten minutes from the campsite we chose as our first getaway in Wallbee last weekend (completely unintentionally, I promise we’re not stalkers). We also both have an obsession for anything vintage. With the rain bucketing down, it wasn’t the beach side rendezvous we had hoped for. Instead of frolicking on the beach, our kids ran amok inside the trailers. First stop Peggy Sue. Next up, a dash through the rain for a dose of coffee and Tim Tams on board Wallabee. 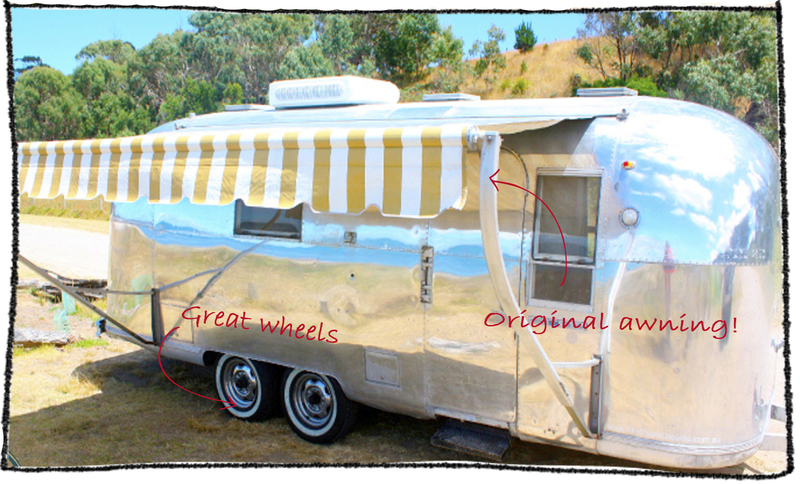 Jess and Scott plan to add to their Airstream fleet in the near future – they currently have this gorgeous 1964 Bambi II waiting to be shipped to Australia. And its not just any Bambi. It used to be the cherished trailer of Rikki Rockett, drummer and co-founder of the American Glam metal band, Poison! We’re looking forward to meeting her one day soon. So nice to hear from you. Thank you so much for always leaving such positive and inspiring comments. You are really a very special person! Now to answer your question on fonts… If you click on Appearance in your Dashboard, then click on Customize. Over to the side of the page is a button which says Customize your blog. Click on that – under Fonts, I’ve used MUSEO for Headings and MUSEO SANS for my body text. You click on color to chose the colors you want and voila. I’m using YOKO as my blog Theme but I’m pretty sure these fonts are just standard. Thank you so much for the Customize tutorial! I’ve chosen the fonts on offer for my Headings and body text but was wondering if there were more options. If you want any other fancy fonts of your choice, what I suggest (which is what I did for a couple of my posts) is to make a Heading in photoshop (or you could just use microsoft word!) and then save it as a jpeg file. Wow that bit you wrote there probably just stretched me to my limit on tech know how 😀 Thank you so much for sharing. I shall explore a little and see what I come up with! Thanks so much. So good to hear from you and hope today brings you more smiles from the Trio. Say hi. 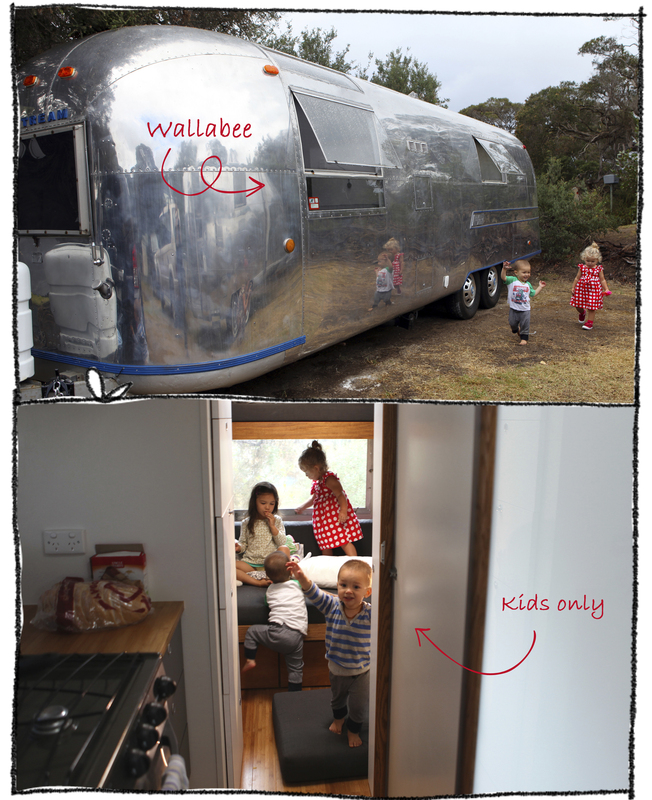 Very cool trailers, and fun pictures of your children delighting therein. I hope Wallabee and Peggy Sue have more get togethers.